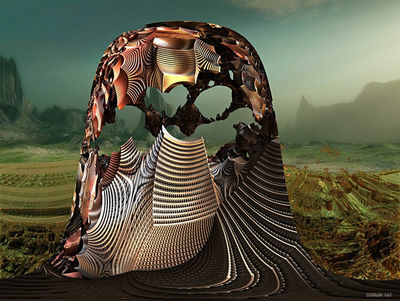 DorianoArt has a real talent for mixing fractals with photography and doing it with style. It’s not the typical marriage between earthy fractals and leafy scenery. It’s more like an extraterrestrial romance between mother earth and alien invaders. Despite such a disturbing courtship, the results are quite natural, or rather, quite unnatural, a hybrid landscape, a cyborg environment of majestic mountains and expansive pixel plains. DorianoArt’s talent is playing match-maker to two fundamentally different image types and bringing about an unexpected harmony. They complement each other, instead of curdling each other like orange juice and milk would. Of course it’s not for everyone, especially for those who see no natural beauty in proliferating plastic scenery. 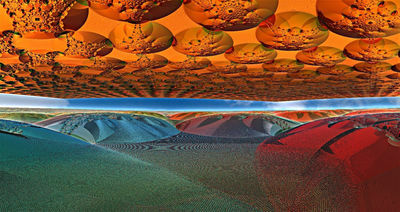 But for those who do, you can learn a thing or two from DorianoArt’s fractal panoramas. 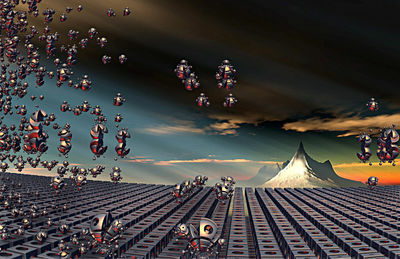 They involve more than just slapping a clip-art sky over a fractal. These sorts of images require a considerable amount of pre-marital counselling. Was he just lucky with this one, or does Doriano know something about composition and design? The mark of a real professional is that you don’t see the marks, it all looks natural and effortless. In case you’re thinking that this is actual snow and ice, I invite you to click on the image and view it full-size. Then you can feast your eyes and the wondrous moire effect, the hallmark of true digital artistry. The sky is real (you knew that, didn’t you?) and yet it blends seamlessly into the ice fields at the horizon. And the sunlight too. Is this the same mountain and hill from the first? The sky is the same too. But one barely notices this because the rolling expanse of striped cylinders draws our attention away and on down to that hazy vista of gently rolling geometry. There is absolutely nothing natural about these striped cylinders (with purple ends). In fact, they’re almost abstract. Who would ever have thought of combining two things like this? Not even Dr. Frankenstein. There is nothing short of pure chemical joy to be found in both the chromafied sky and the pixel-gritty foreground of mercury drops. The glass –-something— in the right midground is just a pleasant extra which, now that I notice it, leads our eye off to the vanishing point of this computerized carpet. The moon, or is that the Earth? is conveniently located right where it is. Who is this master of the fantastic? You know, these images do remind me a little of the cover images for video games. 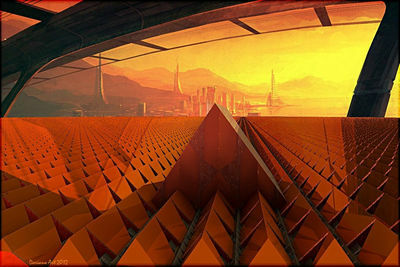 Slick, amazing alien landscapes and impossible combinations of technology and nature. I also remember that the cover art was sometimes more impressive than the games. It’s all fun and games until the Posers show up. Creepy. Doesn’t that bronze, or orange-chrome tubular thing just fit in perfectly with a south-western U.S. desert landscape? 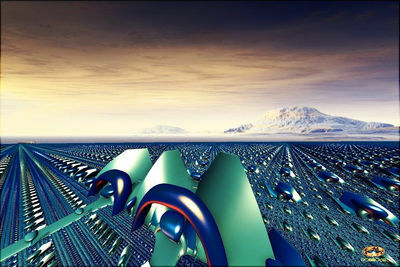 Although, I think those objects on the horizon on the right, which are conveniently located at the vanishing point of the metal drops, are skycrapers and not buttes or rock pinacles. 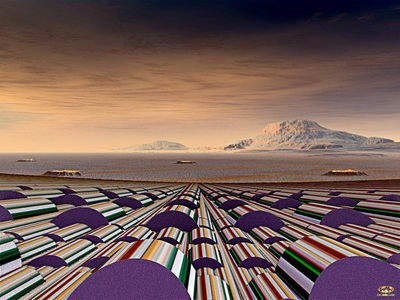 A nice use of pattern, irregular objects, photo-sky and natural city scape. You see? I told you it wasn’t as simple as just slapping two things together. 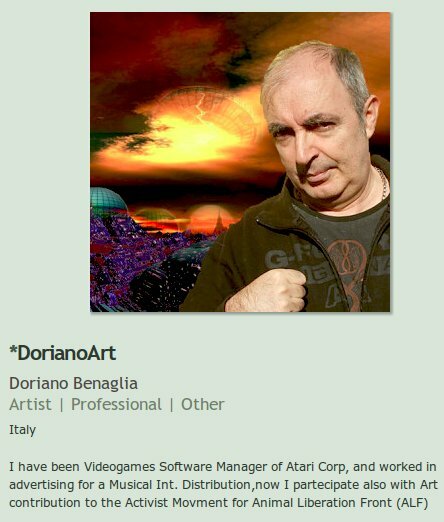 Doriano is an artist not just a computer graphics wizard. Son of da Vinci! I present to you, loyal Orbit Trap readers, the Mona Lisa of our time. Compare it with the real thing, if you’re not familiar with it. Here we have a head-like thing in the foreground with nothing else but a dim, undetailed landscape for a background. Of course, I don’t think Doriano intended such a allusion. But then, did Leonardo intend his audience to fixate upon his subject’s smile? Artist’s create but the audience interprets. 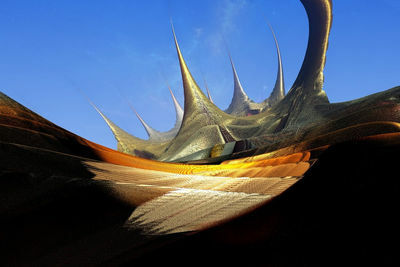 At any rate, I find it to be a richly colored and rendered mandelbulb image. I can’t quite figure out what makes it so interesting, but as I said earlier, good art is a bit of a riddle. Hmmn… So the sky and mountains aren’t photographs at all, they’re made in terragen, the artificial landscape generating program. 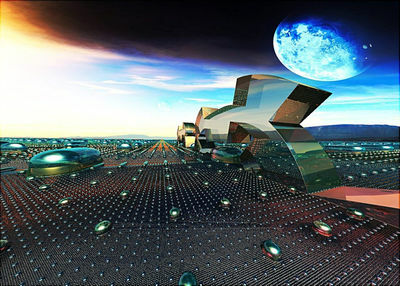 That’s an interesting combination, although the terragen landscapes are so realistic they might as well be photographs. The “mandelbeetles” are an interesting element adding synthetic animal life as well as synthetic ground to the lifelike horizon and sky. Perhaps this is their hive and they are hatching out or tending the next generation. 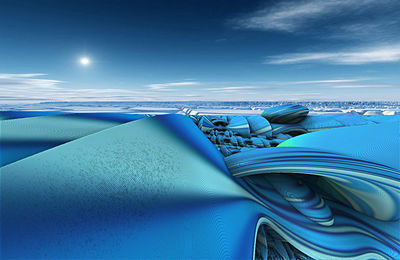 Of course, the truth is probably that they’re both part of the same mandelbulb image and it’s the formula that connects them. This one is pure syntheticism. The land is artificial and the sky, whatever it is, is not even the color, much less anything else sky-like except that it is above. 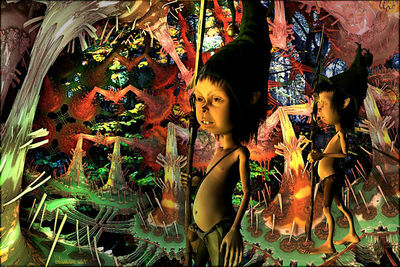 Once again, the colors are rich and multi-faceted which is a talent of computer graphics. Moire and pixel-grit add another scale of artistry here so you’ll want to click on the image and view it full-size, that is, if you like this sort of computer abstract expressionism like I do. I don’t know if Doriano made the city imagery in the top, but he complemented it well with the orange energy collecting cells at the bottom. The lighting is quite well done as if both these image areas were created together. That’s the sort of harmony I was talking about at the beginning. I couldn’t find the first Sindragosa, or the first Robotika one either. I don’t like the search function on Deviant Art. Nothing works as well as Google. This one makes me think of an illustration for a book, perhaps one of Sindbad’s adventures, lost in the desert and arriving suddenly at a mysterious place, which of course shines like gold. What great looming thing is causing that shadow we’re in? I’m sure many people will find Doriano’s mandelbulb/box renderings a little rough, but I find that stylish. 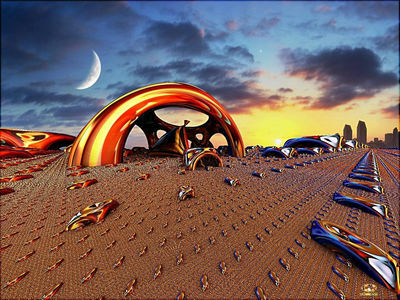 It adds a unique texture to the images and uniqueness is something that one doesn’t see much of in the fractal world; it’s just too easy for all of us to follow the same path without realizing that there’s a lot more creative potential in how you render something than what you actually render. And you won’t get to be the leader of the pack by stepping off the trail. Doriano’s not a formula trail-blazer or technical pioneer (as far as I know), but he’s done great things by being creative with the artwork rather than the tools, and in the end it’s that fresh approach that makes his work stand out.